Here are a couple of pictures I did not expect to take. I was in the Cottian Alps, early in the morning, driving towards the first photo target, the Vallon du Mélèzet. 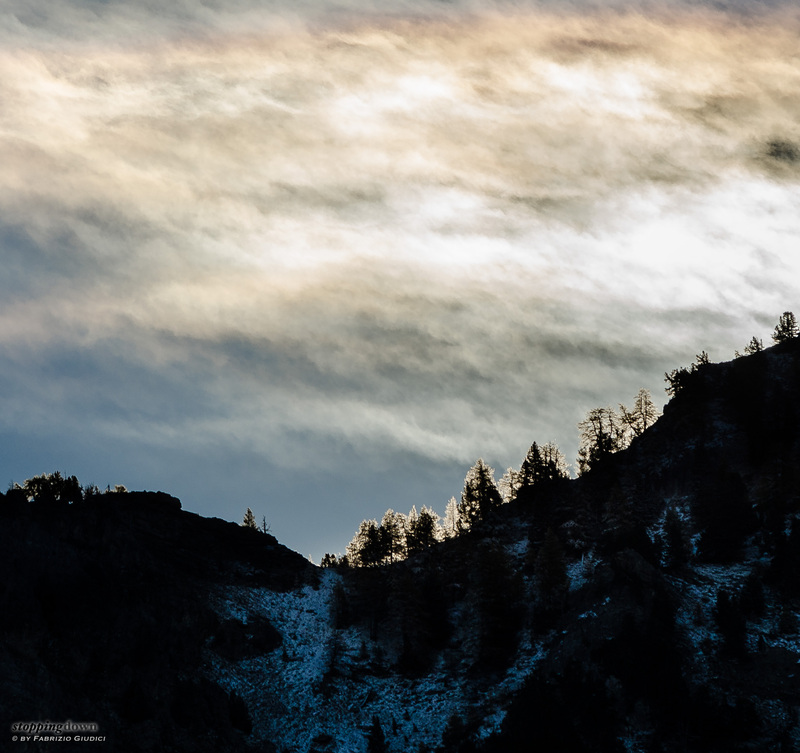 Along the road, that at first climbs in a deep valley, I noticed some back-lighted snowy trees with their silhouette on a ridge, a very small detail in the landscape. At first I did not stop because I really wanted to reach the destination without missing the first morning light (the sun was about to light up the valley). But at every bend the trees were still in front of me, up on the ridge; so, as soon as I found a place to park the car, I couldn't prevent myself from taking some shots. In the meantime a small cirrus popped out, the only relevant cloud in sight for that morning. 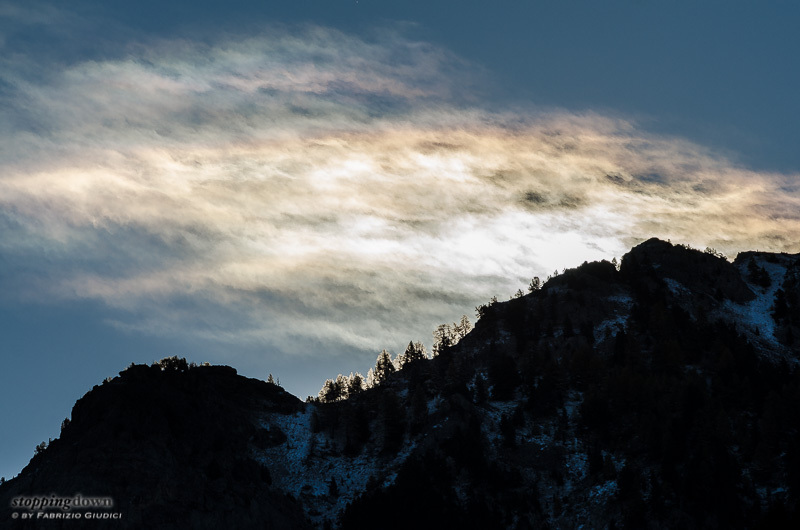 The cloud was slightly coloured, because of a sun 22° halo made by the small ice crystals in the air. During post-processing I kept the colour saturation low because the original colours were so delicate (I didn't spot them at first sight). The white margin on the trees' silhouette lasted for a very short time, ​​a minute later they were gone away. Cirrus et petit halo sur une pente de la Crête de Panestrelle. Nikon D7000 + Nikkor 300mm ƒ/4D ED-IF AF-S @ 300 mm, 1/1600 sec @ ƒ/8, -2.00 EV, ISO 100, hand-held leaning on the car roof. As in the original photo the cirrus steals the scene from the trees, I also created a crop where the halo colours are cropped out, but the focus is on the trees. Cirrus sur une pente de la Crête de Panestrelle.